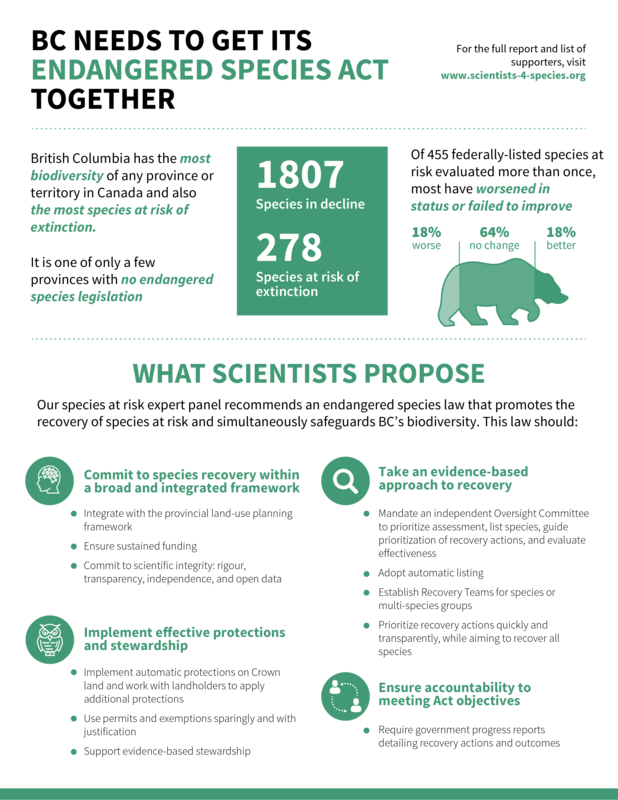 (Vancouver, 30 October 2018) A team of experts on conservation and biodiversity released a report today urging the Government of British Columbia to take a new approach to endangered species law to better protect and recover endangered species. The report's release is timed to hold the government to account on its promise to deliver effective legislation. Despite being home to 278 species at risk of extinction - more than any other province or territory in Canada - BC has no law designed to protect endangered species. Very few species at risk listed under the federal law have recovered. A provincial law is in the works, and the government has called for expert input. "With the populations of wildlife species declining and accusations of negligence, BC needs to step up its game," said Dr. Alana Westwood, the lead author of the report. "In order to recover species like caribou, spotted frogs, and spotted owls, we all need to roll up our sleeves to support meaningful action." The report was released by an 18-member expert team that drew on lessons learned nationwide, with the support of eleven additional experts. The panel recommends fixes to problems that have plagued Canada's Species At Risk Act and other endangered species legislation, including slow timelines and a failure to move from planning to action. 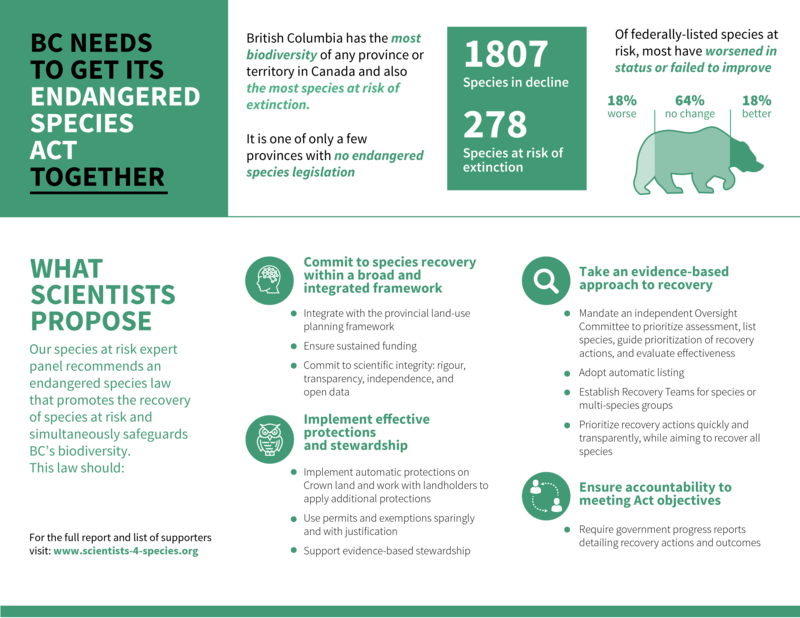 Because speed is critical when trying to recover endangered species, the group calls for a novel approach of empowering an independent scientific body to oversee assessment, recovery planning, and reporting on government accountability. This committee will also quickly assemble recovery teams, particularly in situations where multiple species at risk are found in the same place or face the same threat. These teams would also prioritize recovery actions, to make sure the most cost-effective approaches are tried first. "Prioritizing actions and bundling them together means that we can wisely spend time, effort, and resources to protect and recover biodiversity," says Dr. Brian Starzomski, coauthor and Professor at the University of Victoria. "If the goal is to stop species from going extinct, we have to be smart about it and act fast." The authors also called for meaningful accountability on the part of government by measuring not just what documents have been written, but how populations are doing, and whether or not taken actions work. "Other Canadian species at risk laws document activities that could recover a species - but making a list isn't a substitute for actually taking action and ensuring that endangered species start to recover," says Dr. Karen Hodges, a co-author and Professor at UBC Okanagan. "What we need is ongoing and very transparent reporting about how species at risk are actually doing. If our initial actions don't work, we need to know that, and we need to rethink our actions." Finally, the bar for not protecting and recovering a species should be high. "Like all Canadians, British Columbians care deeply about biodiversity. That's why the explicit goal of the law has to be to protect and recover all species at risk," says Dr. Chris Johnson, coauthor and Professor at the University of Northern British Columbia. "If government makes the hard choice not to recover a species at risk of extinction, then they must follow a formal and transparent process and not hide behind bureaucratic foot-dragging." The BC Ministry of Environment and Climate Change Strategies is currently considering input and drafting legislation. Proposed legislation will likely be introduced in 2019, and citizens and scientists alike are watching carefully. Download the report (titled "Protecting Biodiversity in BC", 27 pages in .pdf format, 4.3 MB, with colour photos). High resolution photos of at-risk ecosystems and species in BC are available upon request from Dr. Westwood. A version of the report has been submitted to the peer-reviewed open-access journal FACETS (www.facetsjournal.com) Manuscript ID facets-2018-0042 on October 29, 2018. The report was funded and supported in part by the Yellowstone to Yukon Conservation Initiative. 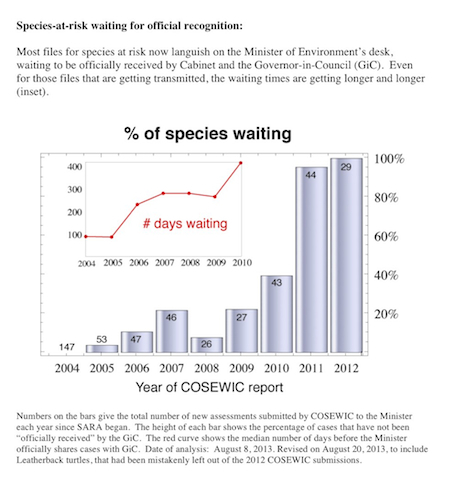 Sue McKee of the University of Ottawa (working with Scott Findlay) has updated the listing timelines and ultimate fates of COSEWIC-listed species, current to March 2018. The current list (as an .xls file) can be found here. Jeannette Whitton, Sally Otto, Scott Findlay, Jeffrey Hutchings, Jeremy Kerr and I published a short commentary on the draft policies on SARA (see below) in Policy Options . A small group scientists who have been following SARA since its inception submitted a set of comments on eight new draft policies from Environment Canada . We highlighted aspects that we felt were major improvements to how SARA is being implemented, and suggestions for continued improvement. Our comments can be downloaded here . CC: Minister Catherine McKenna, Minister Dominic LeBlanc, Daniel Watson, MP Jonathan Wilkinson, Minister Kirsty Duncan. As scientists concerned with species at risk issues, we are pleased to submit the attached comments on the proposed policy documents regarding the Species at Risk Act (SARA). We are encouraged that Environment and Climate Change Canada (ECCC) has recognized several issues in the implementation of SARA and has taken the initiative to clarify its policies and practices. While there are many positive steps forward, we have identified a number of limitations in the draft policy suite that, in our judgment, will continue to reduce the efficacy of SARA. We strongly encourage ECCC to address the general and specific policy gaps to improve SARA implementation and outcomes for species at risk in Canada. Saving species-at-risk starts at the top: where is our environment-minister? We published a commentary in the Globe and Mail on delays in listing decisions under SARA. The figure showing the trends in listing delays is below - a bigger version can be found here . Our database and explanatory notes can be found (as a Microsoft .xls file) here . The Canadian Society for Ecology and Evolution has convened a panel of experts to discuss how biodiversity policy in Canada is informed by science at their Annual Meeting on May 13th. The diverse group of experts from science, law, policy and media, will offer their unique perspectives on how the recent erosion of scientific integrity in Canada is impacting sound biodiversity management. They will examine various angles of scientific integrity, including: how legislation affects the role of science advice, how government policies affect the dissemination and use of science, and the role of media and public engagement. WHERE: University of British Columbia Okanagan campus in Kelowna BC, Engineering, Management and Education Building, Room 050.
WHO: Speakers include Jeff Hutchings, President, CSEE; Mike De Souza, PostMedia News; Gordon McBean, Geography, Univ. Western Ontario; Mark Haddock, Law, Univ. Victoria; Justina Ray, Wildlife Conservation Society Canada; David Schindler, Ecology, University of Alberta. Moderator: Arne Mooers, Simon Fraser University. For more information, you can download a short pdf with a rationale and more information on the presentations. A recent (October 2012) workshop held in Ottawa concluded that, while Canada's Species At Risk Act (SARA) has had some positive impacts, its promise has remained largely unfulfilled due to lack of implementation. Unfortunately, it is our understanding that the federal government is contemplating statutory amendments that would weaken the legislation. To forestall any such attempt, we have written a letter addressed to the Prime Minister Harper pointing out that because most of the problems to date reflect a failure of implementation, there is no scientific justification for amending the Act at this time. We believe that unless there is strong opposition voiced by the scientific community, Mr. Harper will introduce amendments to weaken SARA as he has done with several other pieces of federal environmental legislation. If you agree, please consider signing this letter by registering at this site. Un atelier récent (Octobre 2012) qui s'est tenu à Ottawa a conclu que malgré le fait que la Loi sur les Espèces en Péril du Canada (la LEP) a eu des impacts positifs, sa promesse demeure grandement insatisfaite, principalement en raison de l'absence de mise en application de ses dispositions. Malheureusement, nous comprenons que le gouvernement fédéral comtemple des modifications législatives qui affaibliraient la loi. Afin de prévenir toute tentative de ce genre, nous avons écrit une lettre adressée au Premier Ministre Harper soulignant que puisque la plupart des problèmes à date reflètent un échec de mise en oeuvre, il n'y a aucune justification scientifique pour la modification de la législation à ce moment. Nous croyons que s'il n'y a pas une forte opposition exprimée par la communauté scientifique, M. Harper va introduire des modifications législatives afin d'affaiblir la LEP, tel qu'il l'a fait avec plusieurs autres lois fédérales environmentales. Si vous êtes d'accord, s'il vous plait signer cette lettre en vous inscrivant sur ce site web . This site was originally created to organize and promote lobbying from the scientific community for improvements to Canada's Species at Risk Act. Many of these changes were implemented in the final version of the Bill and we would like to thank those who contributed. Background information on this effort as well as the original letters to the Prime Minister can be found by clicking through to the "Letter Campaign" page in the banner. Subsequent calls to government on the endangered species file can be found Here . This site is also repository for the output from a workshop sponsored by the Canadian Institute for Ecology and Evolution on SARA held in 2009. That output can be accessed here. 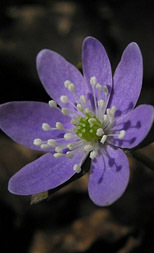 In addition, this site offers a general, plain-language, overview of Canada's Species at Risk Act ("SARA", which came into force on June 1, 2004) and an archive of early SARA-related media articles. This archive is accessable here, and through "Quick Links" in the Letter Campaign section. To paraphrase sociobiologist Edward O. Wilson 1, there are two categories of environmental problems in the modern world. The first is the damage done to the physical environment: toxic pollution, damage to the ozone layer, the depletion of arable land and aquifers. These trends are, with enough will power and effort, likely reversible. The second category is the loss of biodiversity through population and species extinctions. This is irreparable damage. Even if the physical environment is brought back to optimal conditions for human welfare, it will be almost impossible to call back species which have been lost. Every species on this planet has a genetic history stretching back to the origins of life on earth. Their genetic make-up is the result of more than 3,500 million years2 of evolution (primarily by natural selection). One could imagine each species' genetic heritage as a book, present in only a certain number of copies: if we lose the copies, we've lost the book, and all of its fascinating and potentially useful information, permanently. In this way, species loss through habitat destruction, over-harvesting and pollution can be considered to be equivalent to the burning of the library at Alexandria: we cannot expect what is lost to ever rewrite itself. Finally, imagine that all future books could only be written through the modification of books already in existence. While this is an imaginary condition to place on literature, it is an entirely factual constraint on future biodiversity, as new species arise from current species. As a result, loss of diversity today means loss of potential in the future. 1. Wilson, E.O. 1992. The Diversity of Life. Belknap Press: Cambridge, Mass. 2. Nisbet, E.G., N.H. Sleep. 2001. The habitat and nature of early life. Nature 409 (1083-1091). The effectiveness of SARA is strongly dependant on the effectiveness of the recovery strategies and action plans prepared for endangered and threatened species. If you possess scientific, aboriginal traditional, or community knowledge regarding a species whose recovery strategy or action plan is currently available for public review, please contribute your thoughts at the federal public registry. © Scientists-4-Species. All rights reserved. Design by NodeThirtyThree.